We are back from our Hatteras Island vacation, one of my favorite places on Earth. If you follow me on Instagram then you can see the amazing house we stayed at! Vacation is over and now I have the summer blues! All I want is to relax on the beach. 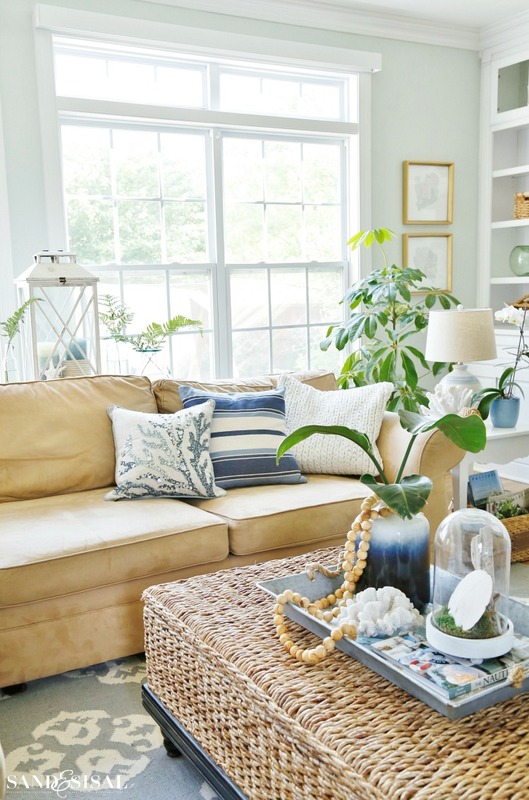 To keep the casual, beachy vacation vibe going, I updated our home with a palette of sea inspired shades of blue like deep navy, storm cloud gray-blue, seaglass, and cobalt. 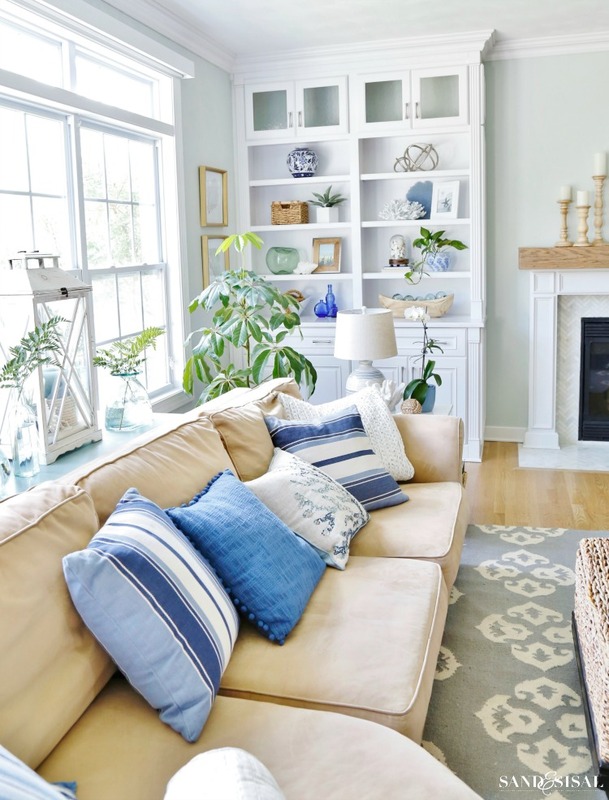 Kick off your flip flops, pour a glass of iced tea and come take a peek at my Summer Blues Coastal Family Room Tour! 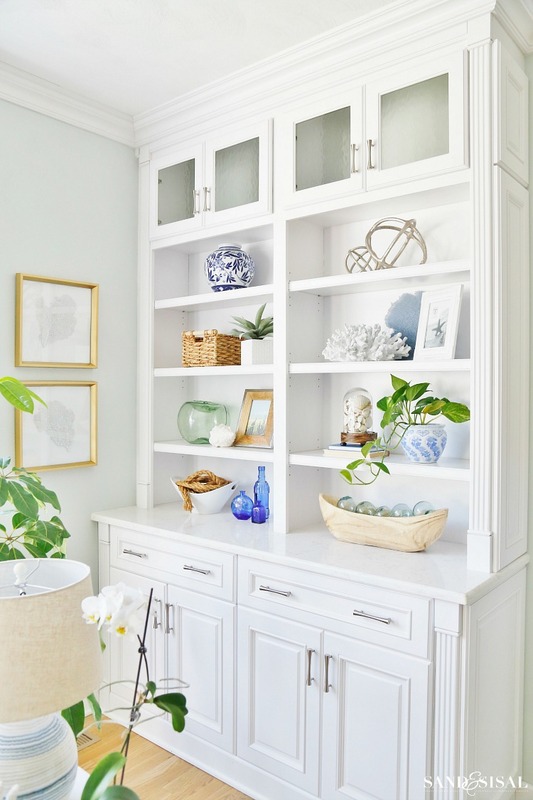 I dug deep into all my closets and cabinets and pulled out every coastal decor item I had. 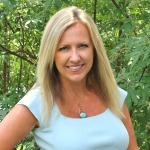 Shopping your home first before heading out to the stores is something I highly recommend. 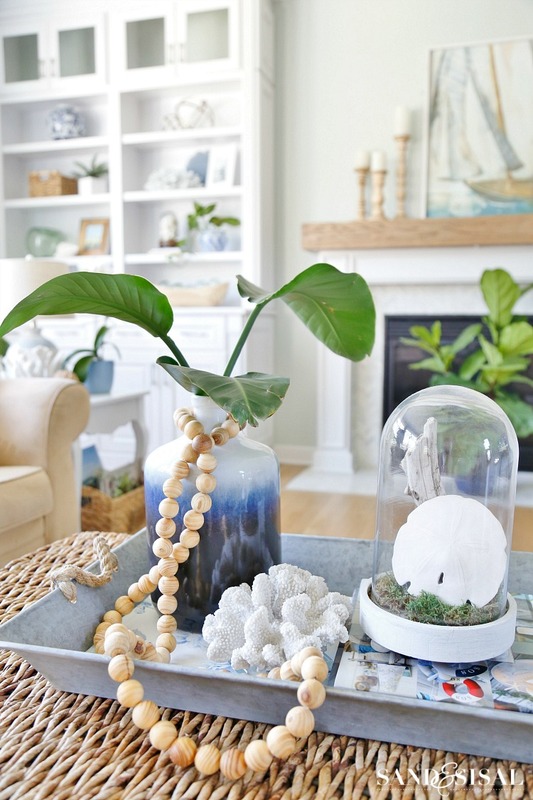 I pulled the sailboat painting from my master bedroom and placed it over our DIY Wood Beam Mantel and balanced it out with a few wood turned candlesticks from the dining room and a huge rope wrapped glass float from the foyer. Shop your home people! 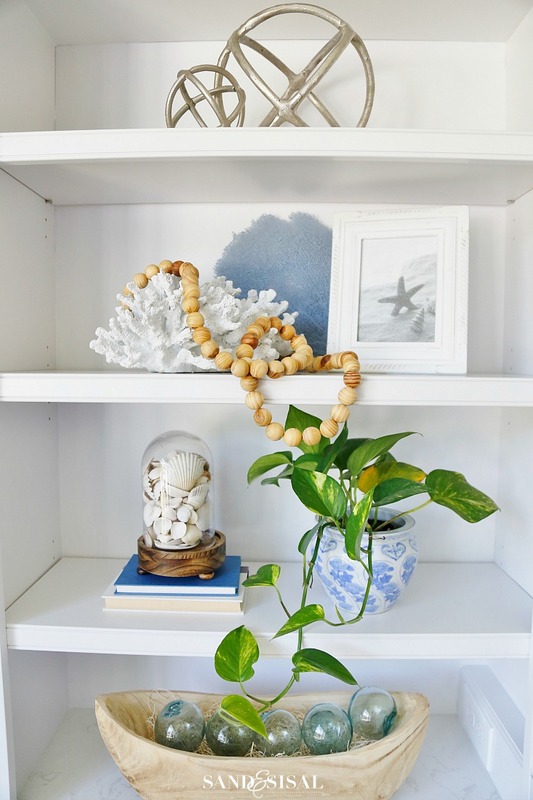 Achieving a summery-tropical feel is easy when you add lots of greenery. The beauty of decorating with greenery stems is that they last for weeks! Don’t be afraid to take clippings from your hosta plants, bush or tree branches, and indoor plants like bird-of-paradise, peace lily or palms. I placed a few bird of paradise stems in a ceramic jug, draped with my DIY Wood Bead Strand and created a cute coastal cloche filled with moss, driftwood and a huge sand dollar. One new thing I did was to paint the back of the builtins white. They were painted with Sea Salt but I wasn’t happy with the look. I still need to paint the backing behind the glass doors. The white backing is much more versatile. 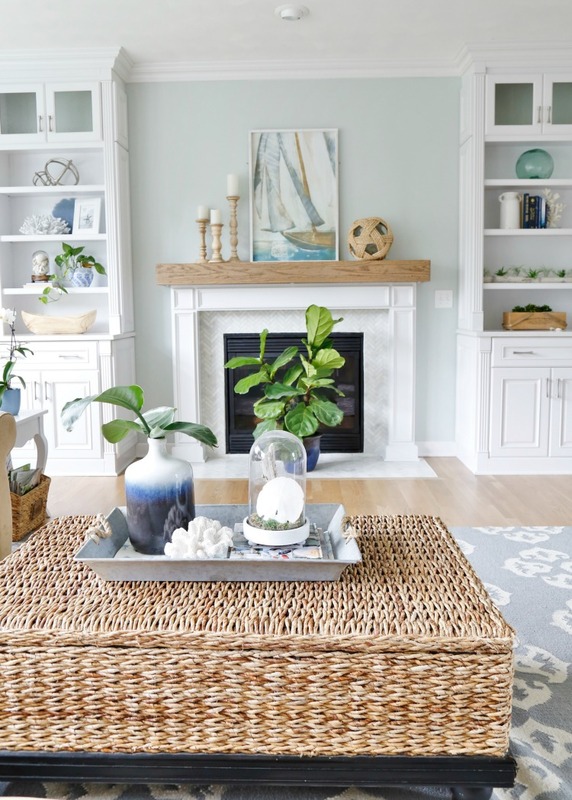 A simple and inexpensive coastal decorating idea is to buy a $3 bundle of ferns from the grocery store and place the stems in a collection of glass bottles and vases. 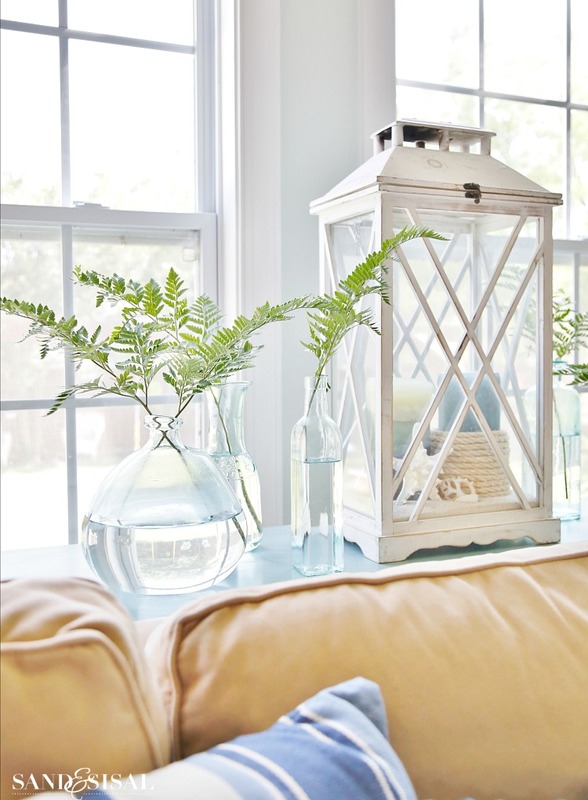 It is a fresh and airy, summery look with little effort or expense. A girl can never have enough throw pillows… though my husband will quickly disagree. 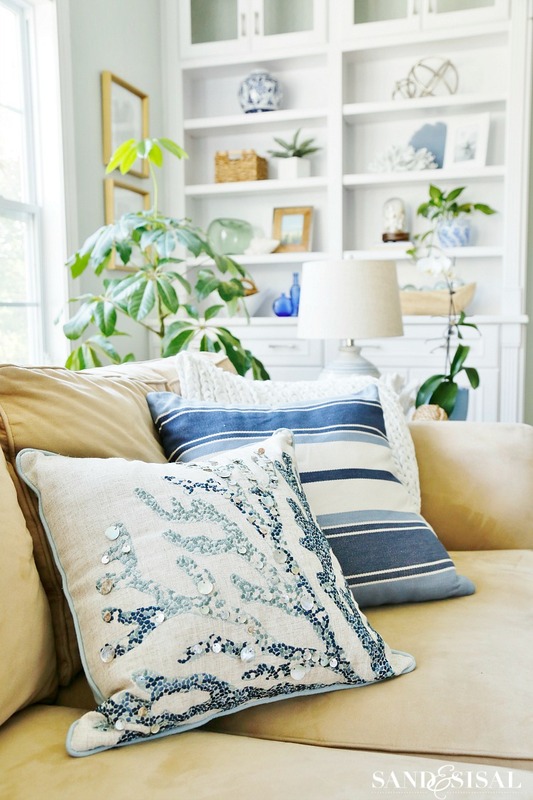 I am in LOVE with these blue and white pillows from Pier 1! I’ve provided direct links for them at the bottom of the post. 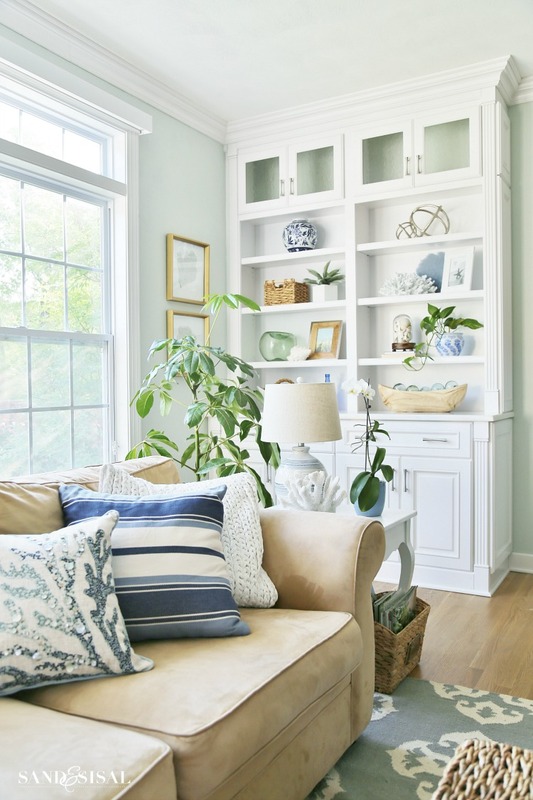 I may not still be on vacation but I’ve created my own little coastal summer blue oasis escape! I hope you like it! 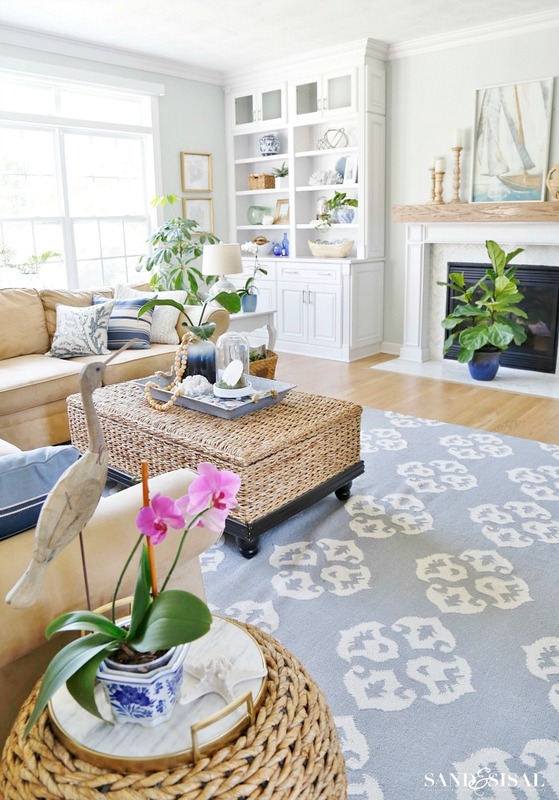 I hope you enjoyed my Summer Blues Coastal Family Room Tour! 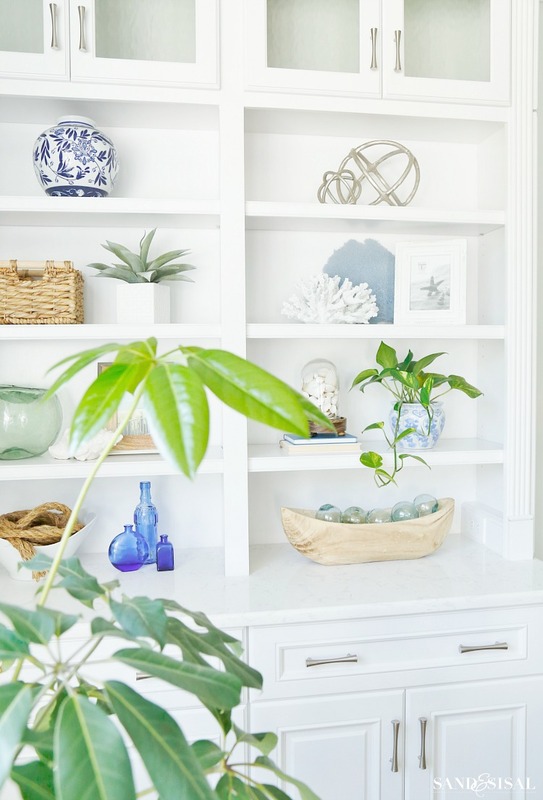 Next up I’ll share a few summer blue updates in the kitchen and kitchen dining area. Lovely Lovely Lovely as usual. By the way how is your son Mark doing? Lovely I can hear the waves and you already had most of the beachy stuff. I love your decorating! You make everything look so beautiful!!! 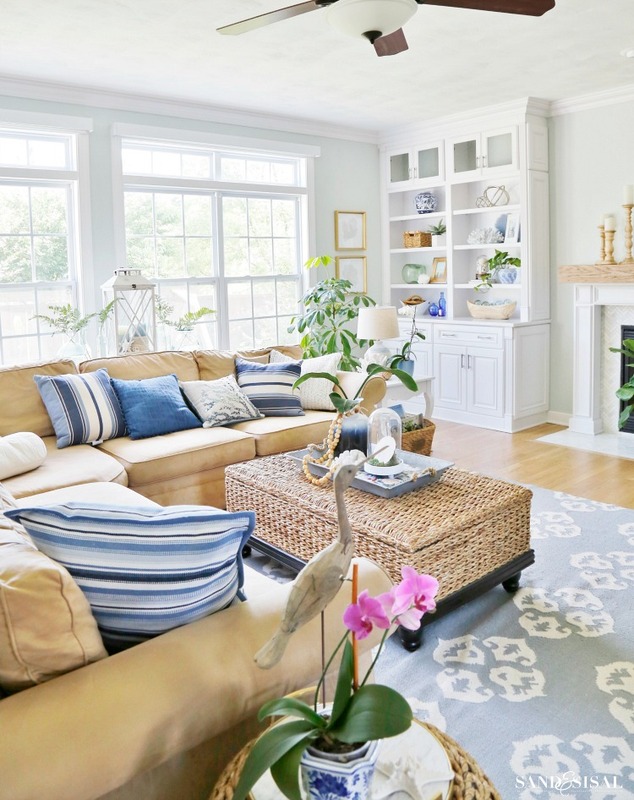 Love, love what you have done in your home. Desperately looking for a coffee table for our new coastal home. Love your woven table. Where did you find it? Would you share brand, etc? Thank you from farther south down the NC coast. Hi Grandy! Thank you so much for the sweet comment! I really appreciate it! 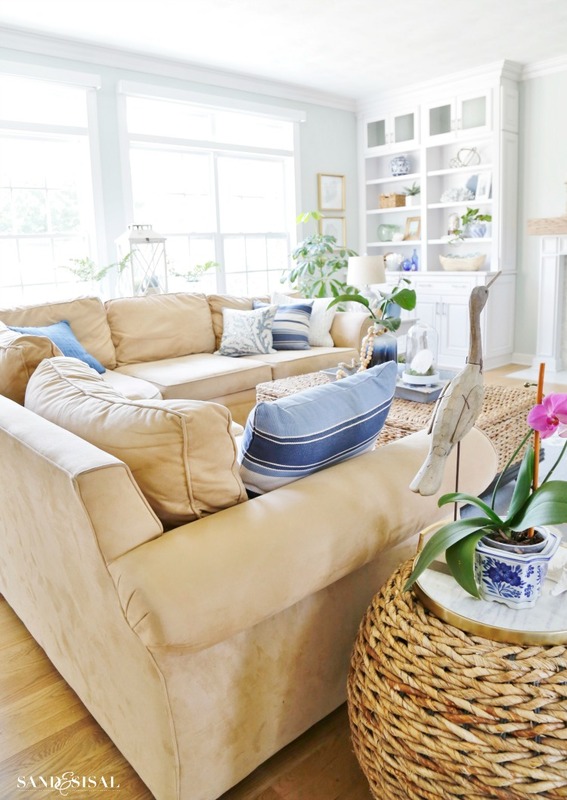 At the bottom of the family room blog post I have blue links for all the products you see in the room, including that woven storage coffee table. Just click the link and it will take you straight to the product. Beautiful! What color is the rug? I also meant to ask you what size is the rug? Thank you for sharing your beautiful room. I love everything about it. I know the sofa came from PB but do you happen to remember the color?